Sehr nettes und gemütliches Hostel am Rand von Zakopane. Es liegt sehr idyllisch in einer Lichtung am Rand des Nationalparks von wo man aus direkt los wandern kann. Sehr nette Mitarbeiter mit spannenden Geschichten und guten Wandertipps bezüglich Wetter und Berge. Jederzeit wieder. Nicht ganz leicht zu finden aber mit der Beschreibung kein Problem und man hat seine Ruhe etwas außerhalb des Trubels. Um im Tatra-Gebirge zu wandern, haben wir uns in Zakopne für das Good-Bye-Lenin-Hostel entschieden. Zugegeben, es war nicht ganz leicht zu finden, daher macht es sich gut, im Hellen anzureisen. Wir wurden mehr als freundlich empfangen und haben und gleich wie Zuhause gefühlt. Die Zimmer sind sauber (eben so sauber, wie es in einer Berg-Hütte geht) und die sanitären Anlagen waren absolut in Ordnung. Frühstück total ausreichend, ansonsten kann man sich auch alles selbst kochen/ zubereiten. 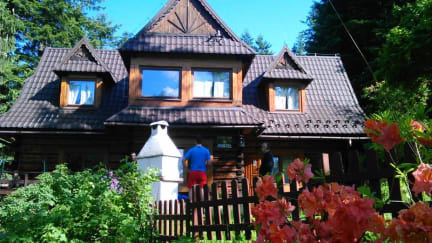 We were in-between hiking in the Tatra Mountains so Good Bye Lenin was a great place to stay! It was the perfect atmosphere for exhausted people who are hiking - very calm, nice people and all information we needed for tours, food and transportation. You can directly start tours here - therefore it is not that easy to go there from Zakopane. For us it was a bit tricky to find the hostel. There is also a bus at the main street that brings you to Moskie Oko, another great spot. Most likely my best hostel stay ever. The house is extremely cosy and all facilities work well. 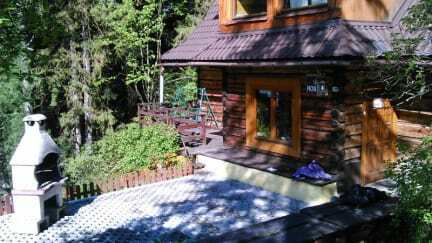 It is located outside of the crowded center of Zakopane, very close to some hiking trails in the national park. The atmosphere among staff and guests reminded me of a group of good friends and every traveller was warmly welcomed. I recommend this hostel to everyone who enjoys a relaxed and familiar atmosphere and I hope to return to the Goodbye Lenin Hostel soon. Nice Hostel to have a chat with other travellers from all over the world and also the staff. It's a very cosy and nice hostel. Especially for Backpackers that want to flee from the crazy tourist town Zakopane. It has a nice flair and you can hang out in the yard and make a bbq. Für Studenten wegen der Lage und Der Stimmung im Haus sehr gut geeignet. Für Kleine Gruppen jedoch nicht empfehlenswert. Keine Möglichkeit sich am Tisch hinzusetzen und vernünftig z.b. Zu frühstücken. Die Lage war toll. Nice location at the edge of the national park. Inside the hostel, it looks rather a bit messy and bathrooms and common area are unclean, while a cat is jumping around. Quite cozy, but very dirty and the common room is too small when everybody is inside (rain, evening etc.). And they had BEDBUGS :/// Also the fridge wasnt working. Would only recommend if you have really low standards! I will never stay at this place again, or I will never recommend it to someone. the room for eight people was very small, without natural light or good artificial lighting and totally without ventilation. not to mention the poor hygiene of all others rooms. the ceiling was too low which made it impossible to sit on the bunk bed. and with all those conditions, a virus made all the guests of the hostel (about 20 people) sick and a lot of pain. I will never be there again.